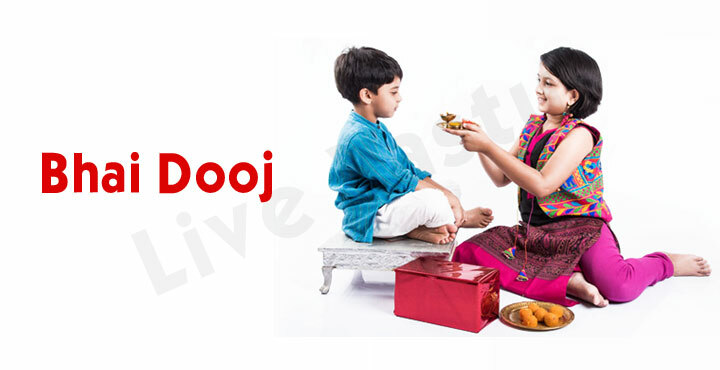 The fifth and the last day of Diwali puja is known as Bhai dooj or Bhai teeka. On this day the sisters pamper their brothers and vice versa. This is performed on the next day of the Govardhan Puja. The historical significance of this festivity goes like this. Many years ago, during the Vedic era, it is believed that Lord Yamaraj, the God of death, had paid a visit to his sister Yamuna on this day. He blessed her with a boon that whosoever would visit her on this day would be freed from all his sacrileges and would attain salvation. Since then, it has been a custom for brothers to visit their sister’s place to know of her welfare and whereabouts on this day. Bhai Dooj is a day dedicated to the special bond which a brother and sister share. This makes this day absolutely unique in itself. This day signifies and stands as testimony for the strong love bond which Lord Yamaraj shared with his sister Yamuna or Yami. It was after many decades of separation that the Lord had visited his sister on this day. The latter showed extreme love, warmth and hospitality to her brother, who was extremely moved by it. She put a tilak on his forehead, to felicitate the occasion and welcomed him with full fanfare and respect. Lord Yama blessed his sister by saying that from now on whosoever visited his sister on this day would gain a long life for him. This year Bhai Dooj falls on the 1st of November 2016. On this day, the sister places a ‘teeka’ of vermilion and rice on her brother’s forehead. She prepares special delicacies and sweets for her brother and welcomes him to her house wholeheartedly. The sister prays for the long life of her brother while the brother blesses the sister and pledges to protect her from all unforeseen situations that she might face in her lifetime. All sisters and brothers eagerly wait for the arrival of this day throughout the year. This brings an end to the five day long Diwali celebrations for Hindus all across the globe. All these five days are celebrated with great religiosity and fervor. Each of these days’ marks the enrichment of human bonds irrespective of the caste or creed that they belong to. This year, the Diwali celebrations would begin from the 28th October, 2016.